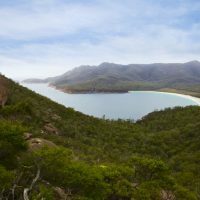 Explore the Freycinet Peninsula as well as local surrounding areas, over four fantastic days of walking and sightseeing. 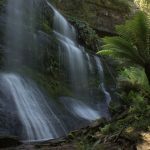 This itinerary incorporates some of Tasmania’s most stunning scenery. Enjoy spectacular beaches, marvel at and walk on amazing rock formations and swim in crystal-clear waters of the Tasmanian east coast. Departing from Launceston we will drive east heading for Coles Bay which is the township leading into Freycinet National Park where we will be welcomed by the dramatic granite peaks of ‘The Hazards’. Today we depart from Launceston with pick up at 8am for an 8.30am departure. We then drive to the east coast town of Coles Bay. Here we will stop for lunch before commencing our walk up Mt Amos. Mt Amos is one of ‘The Hazards’ which are a mountain range within the Freycinet National Park. The Hazards are made up of the iconic rock known as ‘pink granite’ and therefore are a stunning pink and sometimes orange colour. This beautiful mountain does not cover great distances but it presents us with a more challenging walk, however we will be well rewarded at the top with a stunning view of the world-famous Wineglass Bay! We walk from the base of Mt Amos and wind our way up this stunning mountain. This walk does include some rock walking but please be assured we will manage this safely and if conditions are not appropriate then we will change the walk to another day and replace with one that is more appropriate. You will get to experience walking up the beautiful pink granite through low-lying shrub, halfway up you will have views across Coles Bay and the Moulting Lagoon which is famous for its oyster farming and bird species. 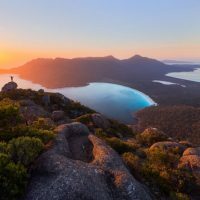 After putting in the effort we will be greatly rewarded at the top of Mt Amos (458m) with stunning views of Wineglass Bay, the Mt Graham and Mt Freycinet range and surrounding islands. As we make the slow and steady descent you will now have a visual of what we have instore for you to experience over the next few days in Freycinet National Park. If the weather is wet, we will offer an alternative walk for this day as the rocks can get quite slippery. After breakfast and lunch making we head off for the day’s walk which takes us to Wineglass Bay beach and Hazard’s beach on a circuit track. 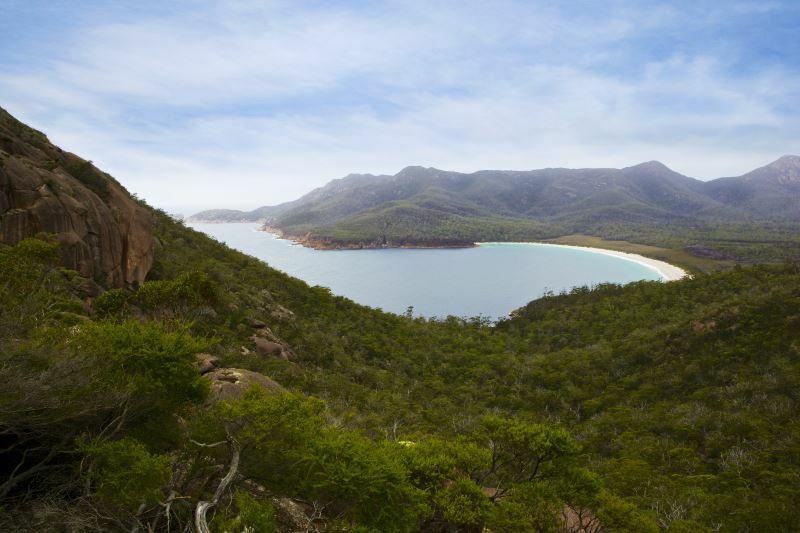 Freycinet National Park is officially 100 years old which makes it one of two of the first National Parks in Tasmania. Freycinet has a unique geological history and therefore some of the most picturesque beaches in the world. Most famously the pink granite beaches and contrasting white quartz beaches which we will be visiting today. Its unique history and rare plant life provide guests with an educational journey while taking in the sights on today’s walk. Whether you would like to watch for birds or spot native wildlife, there’s always something to see in this beautiful national park. The section of trail we travel on today is one of the more popular in the area but it is not to be missed. Today we explore Wineglass Bay and Hazard’s Beach which both hold their own unique history and beauty. Today’s trek includes some bush walking, beach walking and a slight ascent and descent but the scenery and experiences are well worth the effort. Freycinet National Park offers some of the most unique and diverse wildlife experiences. Keep your eyes peeled and if we are lucky we may get to see a migrating Southern Humpback whale or Southern right whale making their way down south. More commonly spotted wildlife includes the White-bellied Sea Eagle, Bennett’s Wallaby’s, short-beaked Echidna’s, Pied and Sooty Oyster Catchers and Australasian Gannets. We stop to explore Wineglass Bay Beach and its history before continuing on to Hazard’s Beach for our lunch stop. At Hazard’s beach you will be given an insight into the history and life of our Tasmanian Aborigines who occupied this area dating back to 30,000 years ago. These coastal areas were important to the aborigines for food, shellfish and marine vegetables. 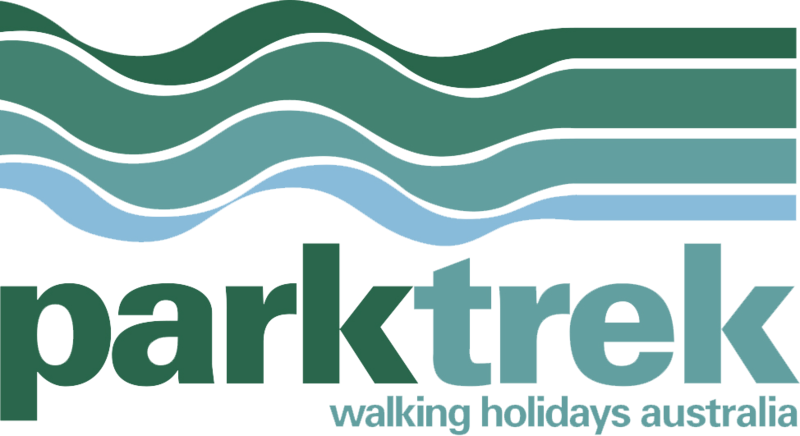 We will learn more about their history as we walk this pristine coastline before arriving back at the Park Trek vehicle by early afternoon. After the day’s walk we head back to our accommodation where guests can refresh and relax. After a quick break we then head off to the local oyster farm to experience some fresh, local produce straight from the farm. Guests will be treated to a fresh taste test of the local produce. On our return to the accommodation one of your guides will have pre-dinner nibbles waiting and a fabulous two-course meal prepared by your guides will be served shortly after. After breakfast, we will meet to walk along the beautiful Richardson’s Beach which will take us to the Coles Bay jetty, where we will be boarding the Wineglass Bay Cruise. The first part of today will be spent enjoying the sights and surrounds of Freycinet National Park from the water. This will provide you with a totally different perspective of the park that can only be experienced by boat. We will cruise south following the coast, stopping to look at various locations and wildlife along the way. Our skipper will keep us well informed on our journey and will be sure to provide us with knowledge of the environment, wildlife species and history of the park. We then continue to follow the coastline south until we reach the Schouten Passage. Here we will learn about the marine and bird life and also the unique history of the Great Oyster Bay. 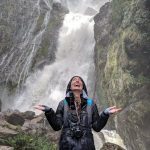 The cruise will then pass through the Schouten Passage and head north along the coast where we will be below soaring sea cliffs and fascinating granite rock formations. The cruise will anchor for lunch in the iconic Wineglass Bay where we will be served a delicious lunch. After lunch we head out of Wineglass Bay and retrace our journey back to the jetty. We are free to experience the cruise outside from the front deck, taking in all the sights and smells or from the comfort of the cabin. A range of bird species also follow this route south including short-tailed shear waters or more commonly known as the mutton bird who migrate annually all the way from Siberia. Make sure you keep your eyes peeled for pods of dolphins, seals or whales! After we return to Coles Bay one of your guides will be waiting to collect you from the jetty where we will drive the short distance back to the Lodge for a short break. Guests can refresh and prepare themselves for our afternoon walk up Mt Parsons. Once we are ready we will depart the Lodge for Sleepy Bay where we will start our walk. Sleepy Bay is located on the eastern shore of the Freycinet Peninsula. As the name suggests Sleepy Bay becomes quite shaded in the afternoons but presents beautiful scenery of pink granite beaches and crystal blue waters. From Sleepy Bay we continue on to Gravelly Beach where we start our ascent up Mt Parsons. Mt Parsons is the smallest mountain included in the Hazards range. However, even though Mt Parsons is less in height the mountain does not offer any less of a view. As we climb Mt Parsons (250m) to our north east we will see Cape Tourville lighthouse situated on the point. Though not as steep as Mt Amos we will still have an exciting journey experiencing rock walking and bush walking to the top of Mt Parsons. Once we descend and return to Sleepy Bay we will return back to our accommodation for a fabulous two-course meal prepared by your guides. After breakfast and lunch making, we head out for our final day of walking and experience one of the more remote areas of the national park. 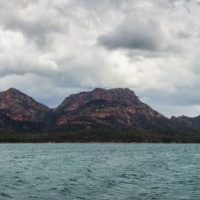 Freycinet National Park is full of Aboriginal and European history. Today we will have the opportunity to gain an insight into both these histories and their significance within the park. 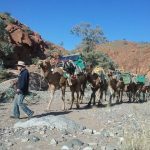 We will start the day with a short explore around Cape Tourville and the lighthouse. We will then be dropped off at the beginning of our walk to the beautiful Bluestone Bay. From here we have a short climb before we begin our gradual descent heading for the white sand of Friendly Beaches. This coastal walk is one of the best kept secrets of the park. We will walk the same journey that the Oyster Bay Tribe would have walked to migrate inland for their hunting season. Lighting up the track are the rare and wonderful wildflowers and bush orchids, watch as the vegetation changes along the track. Once we reach Friendly Beaches we will meet up with our other guide and stop to take in the views over lunch. Then we continue walking the beautiful white quartz sand beach admiring the aborigines middens along the way. Once back at the bus we will be ready to make our journey back to Launceston. With a refreshing stop for fresh local berry ice cream just outside of Coles Bay we will be on our way and back in Launceston by approximately 5pm. If flying out after the tour please do not book flights before 6.30pm. We stay at the Freycinet Cottages which are located in Coles Bay. The one and two bedroom cottages overlook Freycinet National Park, Coles Bay and across to the Hazards Mountains. They are within walking distance to the shops and cafe, and just a short stroll to Richardson’s beach. The one bedroom cabins set in lovely rustic bush land surrounds offer a queen bed with en suite bathroom. The two bedroom cabins have a queen master bedroom and a second bedroom with single beds. Both cabins contain a well catered full kitchen, comfortable lounge area and covered private balcony with stunning views over the water. Access to the beach is right across the road, and the National Park is only minutes’ drive away. 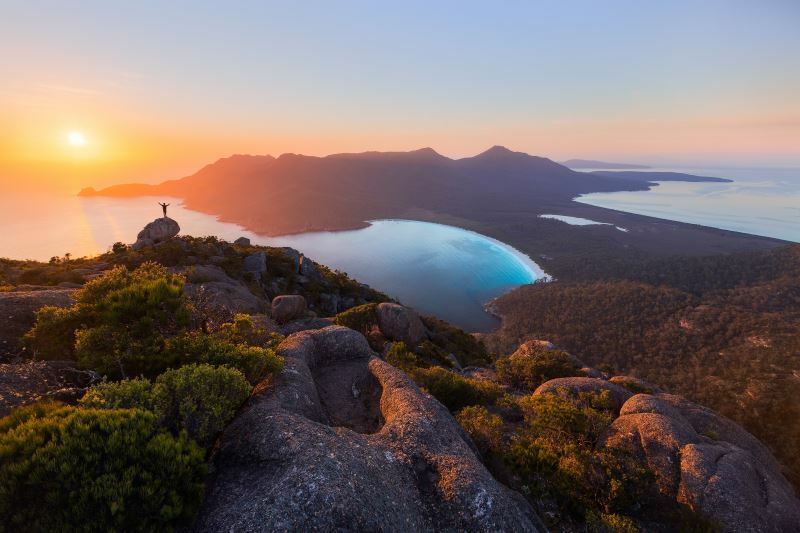 Images courtesy Tourism Tasmania, Tourism Australia, Graham Freeman, Adrian Cook, Andrew McIntosh, Ocean Photography, Paul Sinclair, Daniel Tran, Wineglass Bay Cruises, Kathryn Leahy, Andrew Wilson, Nick Osborne and Pete Harmsen.